It seems one of the most frequent questions I get during any of my couponing classes always is: “How do you know how much to stock up on an item?” It seems like an undeniably difficult answer, but in all reality it is pretty simple. The answer comes down to how much you use an item. Well, that seems straightforward, doesn’t it? But I am finding in my classes that a lot of people are unaware of how much they use an item or how long it takes them to use it. Knowing this information is critical in your quest for frugal living. If you stocked up on yogurt because there was a killer sale and a matching coupon but your family only eats one carton of yogurt a week, you would be wasting your money. But if you knew that each of your family members ate one carton a week, then you could stock up wisely. The key is to know your household well and how it functions. Are there certain times of the year when you use more of an item? How long does it take you to use a stick of antiperspirant or a bottle of shampoo or a roll of toilet paper? Most people can’t answer those questions, but to be a super savvy shopper these are answers you need to know. Antiperspirant doesn’t go bad or lose its effectiveness in a year–so I buy 4 at atime. I know that it takes me 3 months to use a stick of antiperspirant. So when it comes to sale time and finding coupons, I typically aim to stock up on a year’s worth because I know that antiperspirant doesn’t go bad or lose its effectiveness in a year. That means I will stock up when there is a super sale AND a coupon to match with the sale: about 4 antiperspirants. Plus, I also know that I have adequate space to store 4 sticks in my cupboard. Now with a teenage son in our house, who needs antiperspirant, I am trying to learn his rhythm so that I can be sure to stock up appropriately for him. Of course the amount I think he needs and the amount HE thinks he needs is vastly different! I’ll stay on the “more” is better” side! If I didn’t know the rhythms of our household goods, I would either: A) buy way too much and end up wasting it; or B) not buy enough and end up missing out on a rock- bottom price. Either way, I would be throwing away good money that could be spent doing FUN things! Writing the date when you begin using an item on the bottle or package takes the guess work out of when to re-stock yoursupply. Some of this information will (or should be) second nature to you; but if it isn’t, then start a notebook and keep track of both how long it takes you to go through certain items and what the length of their shelf life is. Olive oil is a great example. It is usually good on the shelf for up to 6 months and in my house I use it quite a bit. Therefore, when I stock up, I plan on a 6-month supply. Since olive oil is expensive, knowing this information can usually save me lots of money. Another trick is to write the date when you begin using an item on the bottle or package. This takes all the guesswork out of your information gathering and makes it easy to calculate that item’s usage. As a reminder, if you find an item 75% off its original price then I highly suggest stocking up on it as much as possible. The items I tend to stock up on regularly are household items and toiletries. These are a huge chunk of my monthly budget, so if I can get them for 75% off then I have more cash in my pocket each month. 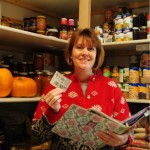 Start now by keeping an inventory of what you use and how long it lasts in your house over the next couple of months. Once you gain this valuable knowledge and use it to your advantage as you shop, I promise you will see the savings!